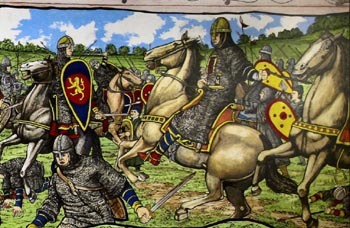 The Pembroke Murals are a series of wall panels painted by husband and wife team, George and Jeanne Lewis of Pembroke. 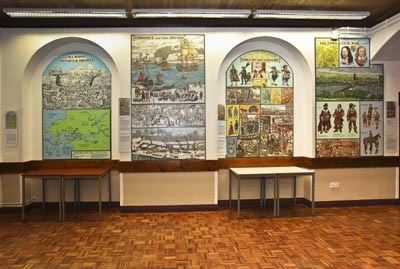 The Murals depict notable events, scenes and people in Pembroke during its development and history from the Stone Age to early 20th Century, are on permanent display in the foyer and upper landing of Pembroke Town Hall. 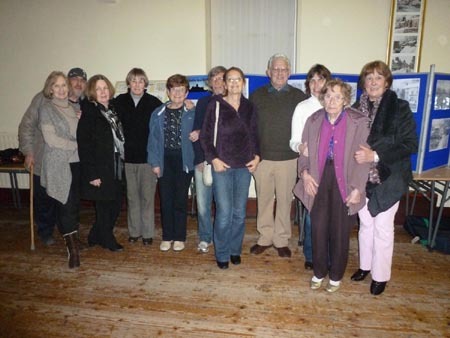 Asked what gave them the idea, George said " I went to the Town Hall one day to see Phil Lloyd, Secretary of the Choir, who also happened to be the Town Clerk at that time. The walls were very bare and I thought that they could do with some paintings. 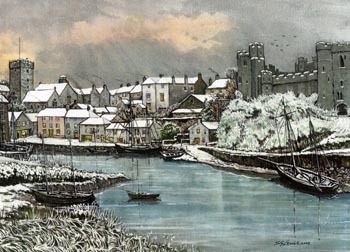 I had already done some paintings for the Town Council designing the Mayor's Christmas cards which depicted historical scenes from old Pembroke and on consultation my wife and I decided to paint a history of Pembroke in a series of panels." 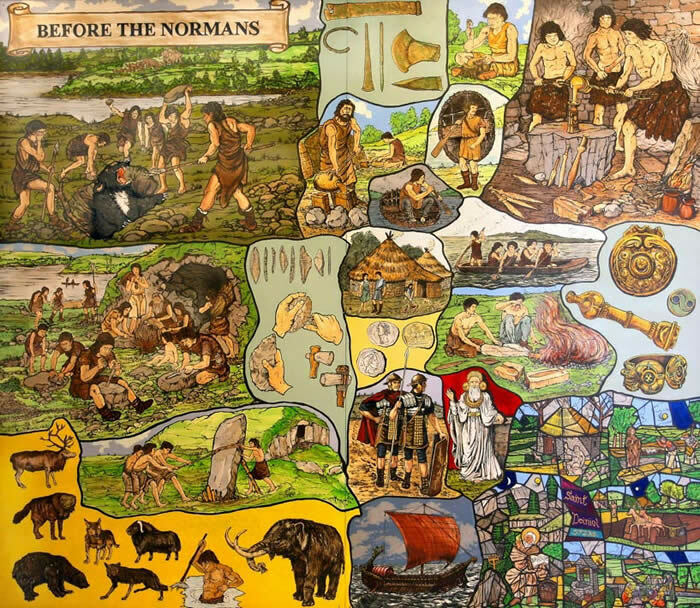 This proved to be a vast undertaking: the first five panels were put in position in February 2006 following considerable research and gathering of visual material. The final panels were put in position in July 2009. 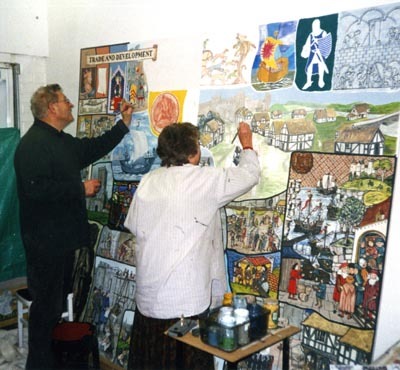 The colourful hand painted panels which cover 700 square feet of wall space were done completely voluntarily: the artists, who devoted hundreds of hours to the project, with the cost of only the basic panels and the final varnishes covered by the Town Council. Each of the twenty eight 7’ x 4’ panels had three coats of white matt emulsion paint upon which the artist drew out the various sections in pencil and painted them using acrylic coloured emulsion. 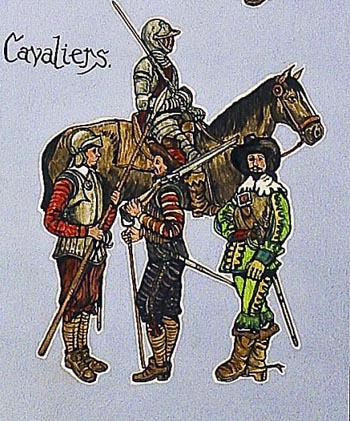 Finally George outlined all the illustrations with a dark brown emulsion, with the exception of the portraits and tapestry work which were painted specifically by Jeanne. The panels were given four coats of protective varnish before being positioned on the walls. The Pembroke Murals are proving to be a prominent tourist attraction. 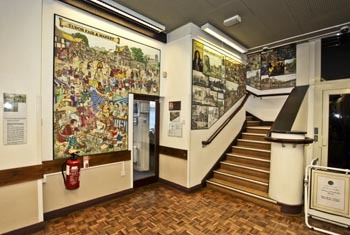 A Guide to the Murals has now been produced by George Lewis and Gene Ryecroft and is available here to download. Just click on the image. 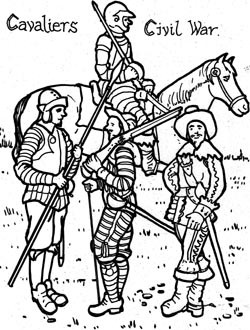 The Guide reproduces all 28 panels with explanatory notes. Photography throughout by Gene Rycroft. 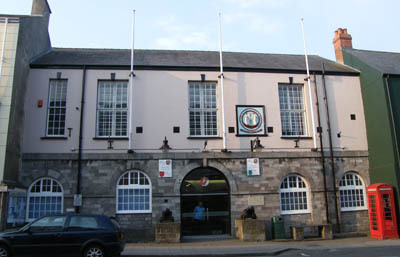 The Guide is also available at Pembroke Town Hall and can be purchased for £2. 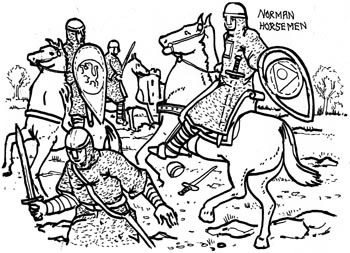 It is intended to produce a colouring book for children based on the Murals. 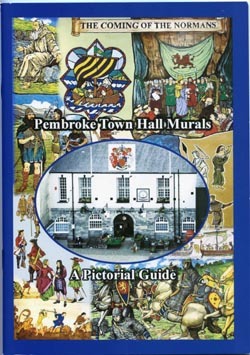 The book will trace Pembroke's history and provide a valuable educational resource as well as an enjoyable activity. 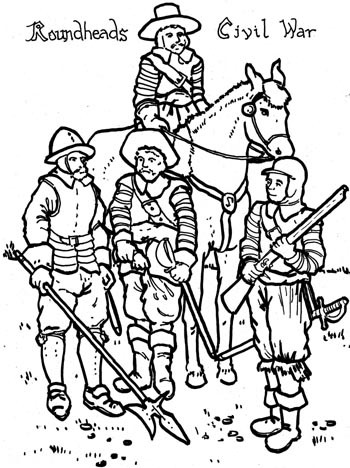 Here are some examples: click the black and white image to download the colouring sheet. 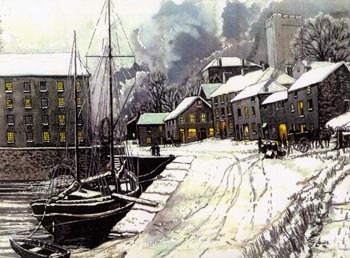 George's distinctive paintings are well known in Pembroke - as well as on the Murals they can be seen on greetings cards for sale around the town. 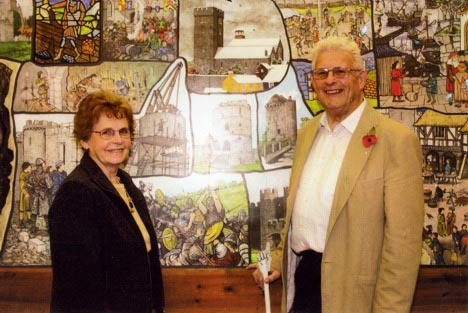 For many years he has been commissioned by Pembroke's Mayors to design the Pembroke Town Council Christmas card. 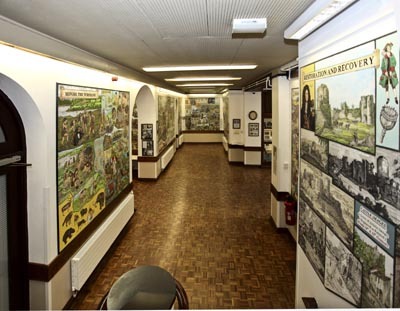 These again are carried out without a fee and the originals are now hanging in the Town Clerk's Office in the Town Hall. 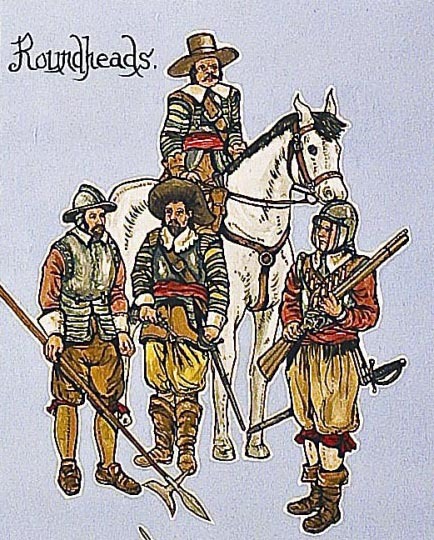 Two examples of George's Christmas cards designed for the Pembroke Mayors. 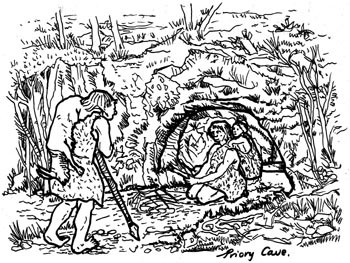 The Society has worked with George on the production of our two heritage leaflets which are available to download from our Publications Page. At our AGM in February 2012, we were delighted to welcome George Lewis as President of the Society for which he has already done so much. 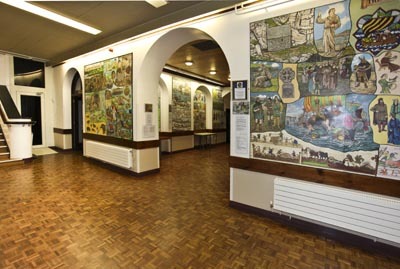 George is a huge asset, a talented artist and personality with a great knowledge of Pembroke’s past, displayed graphically on the walls of Pembroke Town Hall. 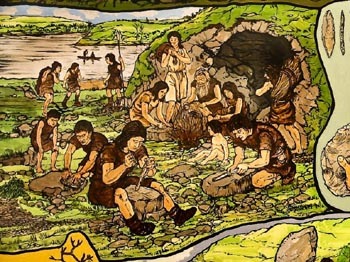 The Pembroke Murals, which George and his wife Jeanne painted, are a huge achievement: it should be remembered that Pembroke not only has a great and glorious past, it has a great artistic heritage too. Many of the great topographical artists of the 18th and 19th century came here to paint the castle and its picturesque surroundings. So who better to be president? 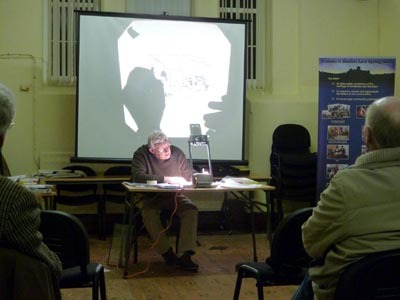 George was applauded enthusiastically by all present and proceeded to give us a talk and demonstration of “the art of pen drawing”.